Which leads to the relinquishing of all views. “The distorted views of afflictive intelligence have no basis in reason,” His Holiness explained. “In the system of the mind certain mental states are countered by their opposites, much as heat eliminates cold. “In so doing he countered the eight extreme views. The Buddha saw that beings are tormented because they don’t understand reality. He taught them out of compassion and a love for them comparable to a mother’s affection for her only child. From his own experience he taught dependent arising to counter ignorance. Among knowledge, knowledge of dependent arising. You know to be supreme, where others do not. And its cessation, as well as the path. His Holiness commented that things are related to and dependent on each other. Ordinary people know that effects arise from their causes, but they don’t think about how causes are also dependent on their effect. It is because cause and effect are dependently arisen that we can talk about causality. Taking up the ‘Guide to the Bodhisattva’s Way of Life’ His Holiness drew attention to what is written at the beginning of the fourth chapter that having made a pledge to work for others’ benefit, if you don’t, it’s like deceiving sentient beings. This is why it’s necessary to cultivate altruism on a daily basis. 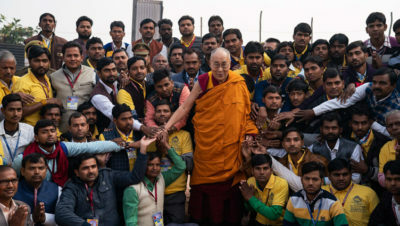 As he reached the end of the chapter His Holiness remarked that the opponents of making effort are laziness, distraction and low morale. He urged his listeners not to give in to low morale because it leads nowhere. He mentioned Mahatma Gandhi, Mother Teresa, Nelson Mandela and Bishop Desmond Tutu as examples of people whose dedication to others rather than self made them popular. Verses 169 – 172 record how to argue with the self-cherishing attitude. “I have completed this reading of ‘Guide to the Bodhisattva’s Way of Life’, the most excellent explanation of how to develop the awakening mind that values the welfare of others more highly than your own. In the words of thanks that followed, gratitude was expressed to the media who have reported the events, to the kitchen staff for preparing food, to all who have facilitated the webcast that made the teaching available to thousands more, to the performers from TIPA and Tawang, and to the children and their teachers who recited the Mangala Sutta every day. A financial declaration was read out. His Holiness left the stage, but continued to interact with people who pressed forward to greet him as he made his way to his car. He drove directly to Farrukhabad airport from where he flew back to Delhi.